The weather-guys/gals predicted a good chance of strong storms on Wednesday night. Yeah … yeah …. yeah … they’ve said this before and we didn’t get even a drop of rain. Well, last night, their prediction was right on … at least in our neighborhood. The wind had been blowing pretty hard all day but it’s March, the windy month. But, about 9:30 pm the sky darkened and the wind became even more fierce. 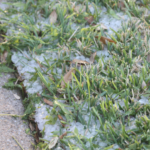 Then, we heard it … the unmistakeable sound of hail hitting the roof, the windows, the yard. The worst of the storm lasted a ferocious 15-20 minutes. 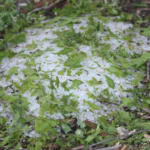 Hail came down and covered the yard so deeply that it looked like snow. 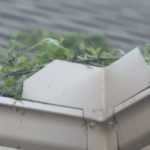 This morning, it was time to look at the storm damage. Fortunately, it was minor. Skylights were intact. Lots of leaves down. 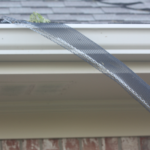 One gutter screen torn loose. 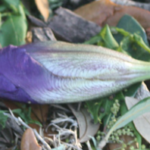 And an iris bud knocked off.